With their increasingly refined Golf Club series, HB studios have sought to provide a comprehensive and challenging golf-simulation experience, and have largely succeeded in doing so. 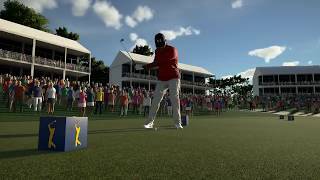 Their latest offering, The Golf Club 2019, continues the evolution of the formula and makes some meaningful additions in the way of online multiplayer and a proper campaign mode that makes use of the PGA Tour license to provide courses and events that will be familiar to anyone who follows the professional international golf circuit. If you are serious about golf, and are looking for a way to experience a nuanced, virtual version of the sport, you will be in good hands here, but if you are more casually inclined, the question of whether this is a good entry point is a tougher one to answer. Regardless if you are a seasoned veteran of the links or merely golf curious, it’s important to note that The Golf Club 2019 represents an iteration on the formula and mechanics found in previous games in the series and not a complete overhaul. If you played either of HB Games' previous titles, you will have a pretty good idea of what you are getting yourself into from a mechanical perspective. You can still use either the right or left analog stick on a controller, or a mouse, to swing by moving the mouse or stick backwards then forwards in a straight line with a consistent tempo. The mechanics are simple to understand in practice but harder than you might expect to do consistently. Deviations to how straight your swing is, or your tempo, can easily send the ball flying in an unintended direction. The handful of tutorials available will walk you through the basics of how to swing a golf club, use a putter, and adjust your shot, but they don’t do a great job of explaining when or to what degree you should adjust your shot. After you go through the tutorials and perhaps spend a bit of time on the driving range, you are plunked onto the tee-box of an actual golf course, and the real learning begins. As with previous Golf Club entries, the game will give you a ‘default’ shot, selecting a club and aiming you in the correct general direction. You can press a button that will zoom the camera forward and show you roughly where this shot will land, but with some major caveats; this ‘predicted’ ball landing location assumes a perfect swing from the player, and also fails to take into account whether the landing is above or below the player, the wind, the condition of the course, or any other complicating factors in the terrain like whether you are on the fairway, in a sand bunker or deep in the rough. These kinds of nuances will be familiar to anyone who has spent any time with the sport, or previous iterations of The Golf Club, but they aren’t particularly well explained here. If you want to make good shots, not only will you have to learn how to swing consistently, but also to predict how the unique conditions presented by each hole will impact the shot and make adjustments accordingly. I suspect most new players might be initially frustrated when their shots don’t go where they expect and it’s not entirely obvious why. If you play practice rounds, the commentator takes the role of a sort of casual golf instructor and will make comments about needing to compensate for the wind or changes in elevation, but that is about it. If you wade directly into the career mode, the more formal commentary won’t provide even these basic hints. If you don’t have a good knowledge of the sport and haven’t played previous games in this series, you will be in for a rather steep learning curve. The upside to the nuanced mechanics is that they make the game challenging enough to be surprisingly engaging. As with the real sport, proficiency comes with experience as you develop muscle memory to help you swing straight and putt the correct distance, and learn how much of an impact variations in elevation, wind speed and direction or any number of other factors will have on each shot. After about ten hours, I felt I was able to make my shots pretty consistently and my scores slowly tumbled from well over par to a few shots under. If you want more of a challenge, you can opt to try out a set of more advanced clubs that let you hit further, but require a straighter swing from the player. While most of this will sound familiar to series veterans, one major addition is a much more structured career mode that makes use of the PGA Tour license. Though use of the license is limited to events and courses rather than players, this is a huge improvement over the bland player-created career mode found in The Golf Club 2. The PGA Tour career mode sees you going through a relatively short series of events to qualify for the PGA Tour, then a much longer one once you quality, with courses and events that will be familiar to anyone who follows the organisation. There are a mixture of major and minor events, and if you want to compete in the most recognizable ones such as the Players Championship, you will need to quality by doing well in preceding rounds. This career mode is a major boon to the experience overall as it gives context and motivation for the core mechanics in a way the previous Golf Club games lacked. The career mode is not without its issues however. The difficulty settings affect the scores of your opponents, but also the course conditions. Rather than have variable course conditions between events as you might expect, they appear to be governed by the difficulty setting so they will always be the same as long as your difficulty settings are the same (aside from wind speed and direction which is highly variable). I also found that it was a bit too easy to do well in overall season rankings, as the other golfers who do well in events seem highly randomised. Even though I performed very badly in a number of events, I was able to easily retain the top spot in the season rankings on the ‘medium’ difficulty because none of the AI golfers performed consistently. You are rewarded with money, but the only thing you can spend it on is cosmetic items which are difficult to get excited about. All in all the career mode is an engaging way to experience The Golf Club’s varied courses and fun mechanics, but it is by no means perfect. Perhaps an even more significant addition to the 2019 package is proper online multiplayer support. Though the somewhat bewildering clubs and societies system that lets you compete with other players' scores indirectly returns from The Golf Club 2, you can now also matchmake into a game with other golfers or set up custom games to play online. The default matchmaking mode is a two player head-to-head mode where rather than compete for the overall lowest score on the course, players compete to win individual holes. If one player gets a lower score than another on a given hole, they get a point. If they get the same score, they split the point. Whoever has the most points at the end of a match wins. I found this to be a very enjoyable mode since you can’t ruin your entire round with a single disastrous hole like with traditional scoring. There is also a team-based mode where players on each team alternate shots that you can matchmake for, and a full set of options for custom online games or local multiplayer that return from The Golf Club 2. It is worth noting that not a lot of people seem to be using the matchmaking, though I was generally able to find matches after waiting for a few minutes. Also returning is the excellent course-creator that lets you try and replicate a local favorite course, or come up with something more imaginative. It is easy to publish courses you create, or find courses made by other players that are well rated. With a very solid selection of official courses and lots of user created ones already available, you won’t have to worry about running out of new terrain to test your skills on. One of the biggest sore points of the series thus far has been its visual presentation, and sadly this is still the case. The Unity engine is once again utilized to produce some very mediocre visuals, though the lighting has been improved a bit since the last entry at least. Texture quality and shadows as well as character models are decidedly dated, and the swing animations are passable but far from fluid. The ball physics are generally fine, but how the ball bounces and rolls when interacting with the transition from fairway to rough, or green to rough, seem a bit off. The audio fares significantly better with the commentary being generally well executed but eventually repetitive and sometimes inaccurate (the tournament commentator seems overly optimistic about putting, for instance). Music is once again relegated to the menus and start/end of matches, and is recycled from The Golf Club 2 but remains a good fit for the game. The Golf Club 2019 is a robust and comprehensive golf sim with a greatly improved but still imperfect career mode and good implementation of online multiplayer. The underlying game engine remains the weak point of the package, but the robust and challenging mechanics alongside the excellent selection of official and custom courses kept me consistently engaged, and I experienced only a few minor bugs and glitches. Those looking for a way to keep lowering their scores off the links would do well to give this a look. A few lighting enhancements can’t hide the dated visuals produced by the Unity engine; audio is solid with well executed commentary and the interface is slick. Challenging, deep and ultimately satisfying swing and putting mechanics that are simple to understand but difficult to master on a great variety of courses, though the learning curve might be a bit steep for newcomers. The PGA Tour license is used effectively to create a more structured career mode that takes you through the many official courses; custom careers and practice rounds alongside a great course-creator remain from previous games. Matchmaking into head-to-head and team games alongside custom online matches are welcome and well executed new additions. The somewhat confusing clubs and societies system also return from previous games. The game generally runs well and loads quickly. I encountered only some minor visual bugs and glitches. The addition of proper online multiplayer and the PGA Tour career mode make The Golf Club 2019 a meaningful improvement over its already impressive predecessor, even if the initial learning curve is on steeper side and the visual presentation remains stuck in the past. "Clear skies and open fairways"
The Golf Club 2019 is ranked #476 out of 1434 total reviewed games. It is ranked #24 out of 146 games reviewed in 2018.